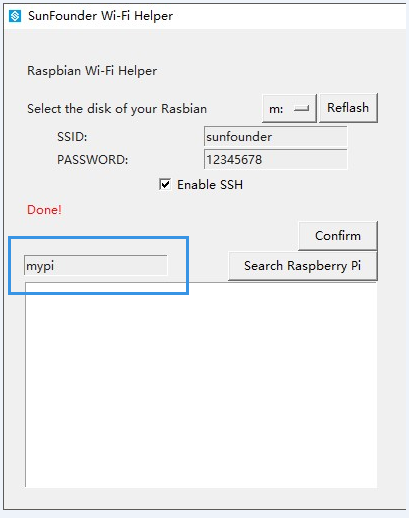 If you also have no clue how to connect the Raspberry Pi to the Wi-Fi and check its IP address, you're as lucky as our customers who often ask this question. 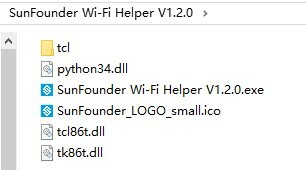 The trouble shooter has to be this: SunFounder Wi-Fi Helper, a small piece of software based on Python and TkInter. But how? Check the following steps. Double-click SunFounder Wi-Fi Helper V1.x.x.exe to run the software. 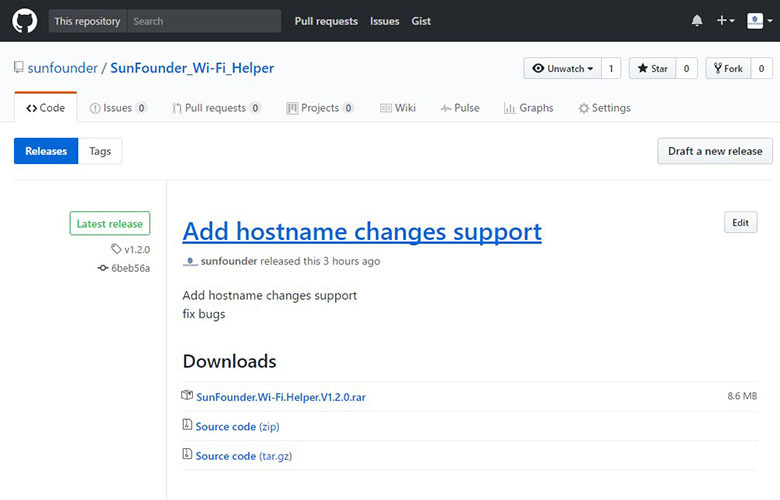 When the software opens, set the network. Make sure Raspbian has been burnt to the TF card. 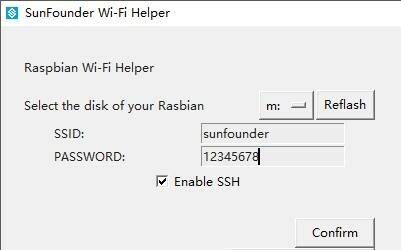 You need to take the TF card out from the Raspberry Pi for Wi-Fi configuration. Plug the card into a USB card reader and insert the reader into the computer. Wait till the disk of the card is shown under My Computer. Click to enter. But if you cannot find the disk for the TF card, click Refresh to try. If it still fails, check that the Raspbian is burnt, and the card is plugged into the computer properly. Enter your SSID and PASSWARD. If you need to use SSH, tick the checkbox of Enable SSH. Check again the SSID and PASSWARD, click Confirm. Then a prompt message "Done!" appears at the lower left corner, meaning connection is done! 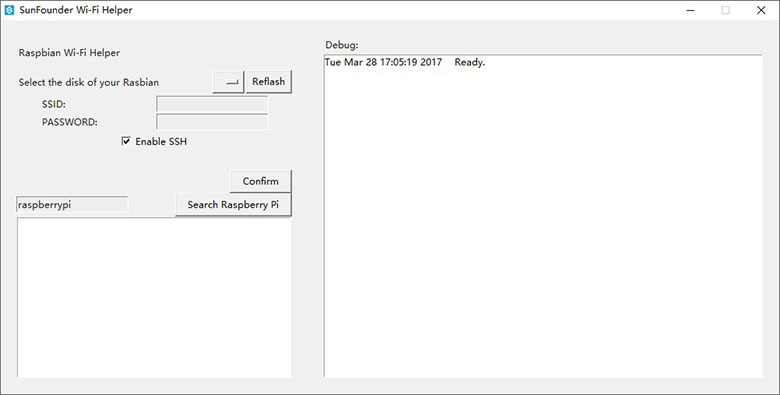 In the text box Debug on the right, you can also check the debugging information. 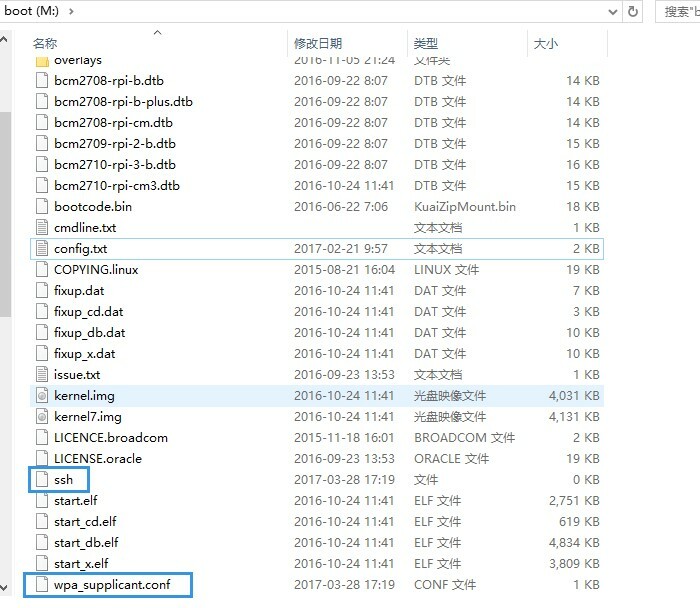 Based on the printed lines, you can see two files are created, which you can see under the boot folder in the TF card path. 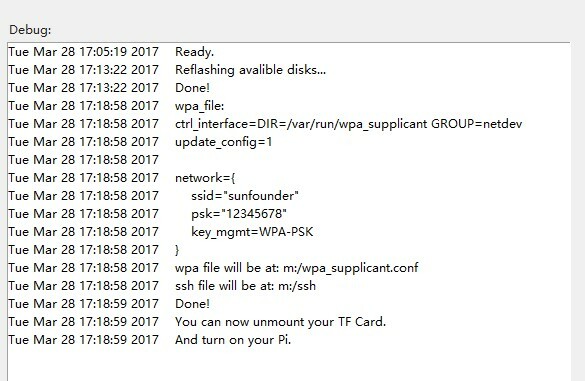 Now you can unplug the TF card and insert it back to the Raspberry Pi. Boot the board. Before checking the IP address, make sure the Raspberry Pi is booted normally and Wi-Fi is set good. If you're using other models than 3 model B, connect a USB Wi-Fi adapter to connect to the network. 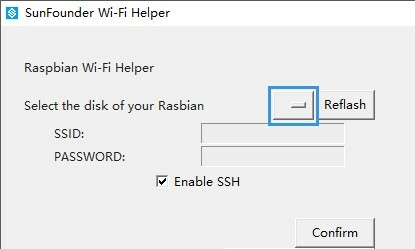 Enter the Wi-Fi's SSID in the text box, click Search Raspberry Pi under Confirm. 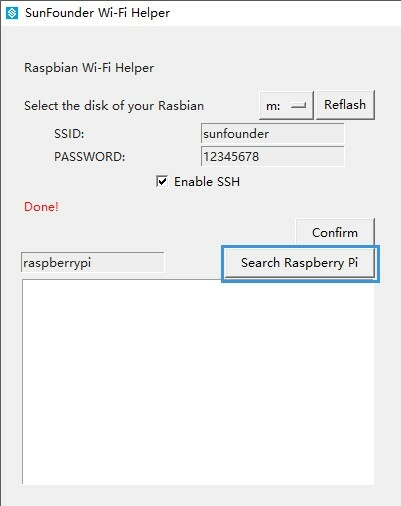 Click Search Raspberry Pi and you can see the name and IP address at the box below. So the connection is done now. Pretty easy and convenient, I bet. 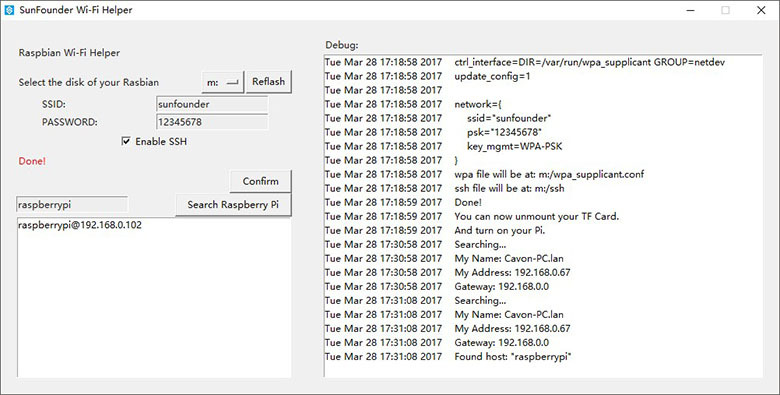 Now that you know the IP address of the Raspberry Pi, you can log in remotely or remote desktop! By the way, you may notice that this small piece of software is published on GitHub, and yes, it is totally open source! Welcome to Fork, Pull and Push in the repository. Welcome to share with us your ideas by leaving comments below or post on FORUM.